First Friday of Lent: Happy Birthday Irene! Woke up this morning with a severe headache, in all likelihood caused by the myriad of problems I know I have to face today. So, at 5:30 A.M. decided to just get up and face the day. Sipping on that first cup of coffee and contemplating on this First Friday of Lent I felt these words run through my entire body:”I am always with you”. These words are fitting because not only are they true, but because they are true for all of us, especially to the woman whose birthday we celebrate on this First Friday of Lent: Irene Sendler. Born this day in 1910 outside of Warsaw, Poland, Irene was the daughter of a doctor whose patients were primarily poor Jews. 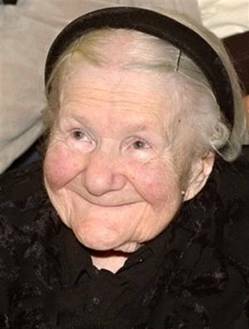 This remarkable Catholic woman saved over 2500 Jewish children from the Warsaw Ghetto, was arrested by the Nazis, imprisoned and tortured. She managed to escape after the Polish underground bribed some guards, surviving the war and living to be 98 yrs old. She passed away in 2008, the same year my family was fortunate enough to visit the beautiful city of Warsaw, Poland. Her life is profiled in a play called Life in a Jar, and it is performed across the country. Visit the website http://www.irenasendler.org/ to find the date when it is playing in your area, and to read more about the girls who “discovered” the story that was Irene’s legacy. I found it highly ironic that four Protestant teenage girls from Kansas, USA are the ones who gave the world Irene’s story; God does work in mysterious ways, and on his own timetable. I do not think there is a better way to celebrate the First Friday of Lent than honoring Irene. Her life is a testament to the truth that one person does make a difference. We are all called to make a difference and each one of us needs to discover for ourselves how to do s0. Irene’s actions were never publicized outside of Warsaw until those four girls from America were asked to do a research project. And unlike Irene, most of us will never know what impact we have had on another’s life. But He who sees all, knows all…and what better way to end our days than for Our Lord to say to each one of us “you did well”. This Lent may we discover how each one of us can make a difference in someone’s life.